The above info came from jonathan gruber, and was edited by yours truly (contact me). The image came from delroy. This version of Pokémon is different than the series we all know and love. Why? Because there aren't any humans, and the Pokemon speak... in English! 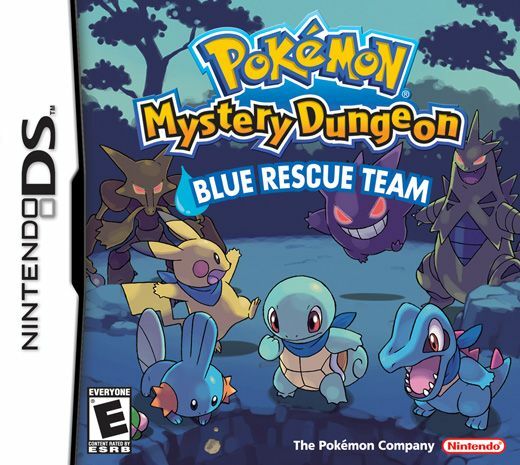 Pokemon Mystery Dungeon is about a boy who woke up one day to discover that he's a Squirtle (he tells a Charmander that he's a human, but the Charmander said that he looks like an ordinary Squirtle). There are natural disasters in the land, and the Pokemon are forming rescue teams. Squirtle is on team Go Getters, and his other two team mates are Chikorita and Charmander. Squirtle's first mission was to find Pichu's older brother.